Are you looking to have Organic Fruit and Vegetables Home Delivered? At Red Hill Fresh, we can help you! You have the choice to select a “Seasonal Box” or create your own “Wholesome Box of Goodness”. If you select a Seasonal Box you can choose the “Set N Forget” option, where you can have your box delivered on a Weekly or Fortnightly basis. Once you put your first order in, then we’ll take care of the rest, so you don’t need to do a thing! Creating your own “Wholesome Box of Goodness” to suits you and your families needs is a great way to know you’re providing the most nutrient-rich produce from paddock to plate. Simply browse our online cart and add items as you go. It’s that easy! We will keep you up to date with a short Text message about our specials and new products, as a handy reminder to get your order in on time so you don’t miss out. 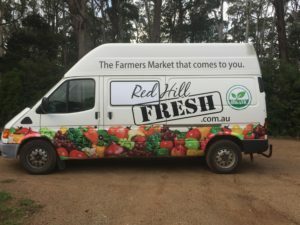 Red Hill Fresh delivers all over the Mornington Peninsula with quality Organic Fruit & Vegetables, fresh from the farm. We also offer a wide range of essential items, such as milk, bread, dairy & meat just to name a few, straight to your door. We carefully hand select Seasonal Organic Produce to go into your Wholesome Box of Goodness. This is dependent on what is in season, what our local farmers are growing, quality of produce, so we can fill your box with Wholesome, Nutritious, Organic Goodness! Each week we update the Red Hill Fresh website with the latest prices and what goes in our Seasonal Boxes based on current market availability. Unfortunately, we are unable to cater to individual dietary requirements or substitutions in the Seasonal Boxes. We suggest that you select your own items to go in your box. Log In & Place Your Order before 7am every Tuesday. This will allow you to ADD any Extras, REMOVE any items or INCREASE the quantity on produce that you may have run out of. This helps reduce waste, by not accumulating an abundance of the same produce. Watch this short video to learn how to search for a product. Your nominated subscription will automatically renew on your behalf, so there’s no need for you to do a thing! This will allow us to source the freshest produce available and as we know when it is harvested and delivered to the market. Your Seasonal Box of Wholesome Goodness is delivered on Thursday’s* or Friday’s* in our Refrigerated Van. Why wait start shopping now.